Researchers at the RIKEN Advanced Science Institute (ASI) have developed a theory that provides an understanding of relativistic electron vortex beams. Through the combined consideration of quantum and relativistic properties of the electrons in the beam, the researchers found that spin–orbit interaction results in a different behavior for vortex beams made of electrons with spins pointing up or down, respectively. Whether a car or a ball, the forces acting on a body moving in a straight line are very different to those acting on one moving in tight curves. This maxim also holds true at microscopic scales. As such, a beam of electrons that moves forward linearly has different properties to one with vortex-like properties. Since vortex beams show properties in magnetic fields that could lead to novel applications, a RIKEN-led research team has developed a theory that provides an understanding of these properties1. “Ours is the first comprehensive theory of relativistic electron vortex beams and adds significantly to their understanding,” comments team member Konstantin Bliokh from the RIKEN Advanced Science Institute (ASI). Like any particle, electrons can exhibit wave-like characteristics; and, understanding this behavior is critical to understanding the behavior of vortex beams so they can be harnessed in future applications. Unlike the broad front of an ocean wave hitting a beach, however, the oscillations of electron waves are out of sync along the beam: the slight shifts in their timing gives the waves a corkscrew character. A vortex beam shows unique and potentially exploitable quantum effects arising from the interplay between the so-called ‘orbital angular momentum’ of its electrons and their intrinsic property called spin. The potential of these beams became apparent only recently, when they were demonstrated for the first time by Masaya Uchida and Akira Tonomura from ASI2. The complex mixture of electron spin, beam vortex properties and the relativistic properties of the electrons has complicated the theoretical understanding of the beams, says team leader Franco Nori also from ASI. He explains that their fundamental theoretical description was possible only through the combined consideration of quantum and relativistic properties of the electrons in the beam. This provided new insights into the interaction between the electrons’ spin and the vortex property of the beam. 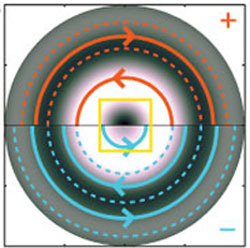 In particular, the researchers found that this so-called spin–orbit interaction results in a different behavior for vortex beams made of electrons with spins pointing up or down, respectively—an effect that should be observable (Fig. 1). Beyond providing these fundamental insights, the new theory also has sound practical implications, as the beams are very sensitive to magnetic fields, according to Nori. “The theoretical understanding that we have reached will eventually contribute to the development of enhanced electron microscopes that can image magnetic materials with atomic resolution,” he says. Be the first to comment on "Researching the Properties of Relativistic Electron Vortex Beams"